Right now we are at the height of ramsons season here in Denmark (ramsløg in Danish). I’d never encountered them before, and I assume it is because it is native to Europe and so not generally found in the US. They are quite fashionable in Danish kitchens these days. 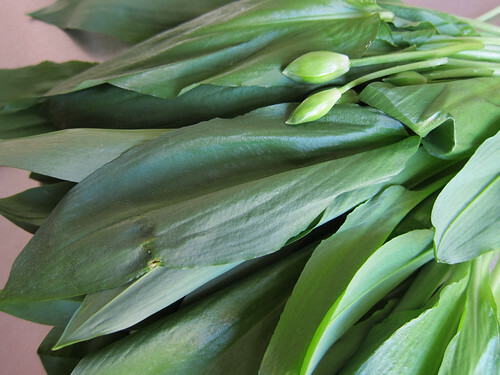 Ramsons are a member of the Allium family, kin to garlic, onions and chives. The flavor is a great blend somewhere between garlic and chive, and you can eat the whole kit and kaboodle: leaves, bulbs, and flowers. We’ve been using them in various ways from simply adding them as salad greens, to making a pretty kickin’ pesto. They are great in a omelet as well. I’ve also heard tell of making ramsons capers from pickling the flower buds, which I’m dying to try out since I have a deep, deep love of capers and garlicy ones sound divine. I’m hoping to go bud picking this week since the buds are just starting to come up. They grow abundantly in Denmark and I learned that you can go pick them even in the heart of Copenhagen. In one of the large parks here, Søndermarken, which not far from where I live, they grow all over the place and you can simply go for a short walk, grab a handful or two of ramsons and head back to the kitchen, cackling all the way. Or well, maybe that is just what I do when I feel like I’m getting away with something. Definitely worth tracking down if you can find them around you. Here in Copenhagen you can always take a little bag and swing through Søndermarken, scooping them up as you go (there are tons of them on the path that runs parallel to Bag Søndermarkn, especially towards Sondre Fasanvej). If you are too lazy for that, several grocery stores are selling them now. I know I’ve seen them at Irma. But hey, why pay 15 kr when I can snag some for free on my way home?